New York – On Wednesday (20/09), the UN Migration Agency’s Director General William Lacy Swing and Bangladesh's Prime Minister Sheikh Hasina met during the UN General Assembly in New York to discuss humanitarian aid for the thousands fleeing violence in Myanmar. Bangladesh, already host to approximately 300,000, had welcomed 74,000 after an incident in October 2016 and a further 429,000 people, who are seeking safety from an outbreak of violence in Rakhine State, Myanmar, on 25 August. Since 2013, IOM, the UN Migration Agency has been mandated by the Government of Bangladesh to lead the humanitarian response in Cox’s Bazar. 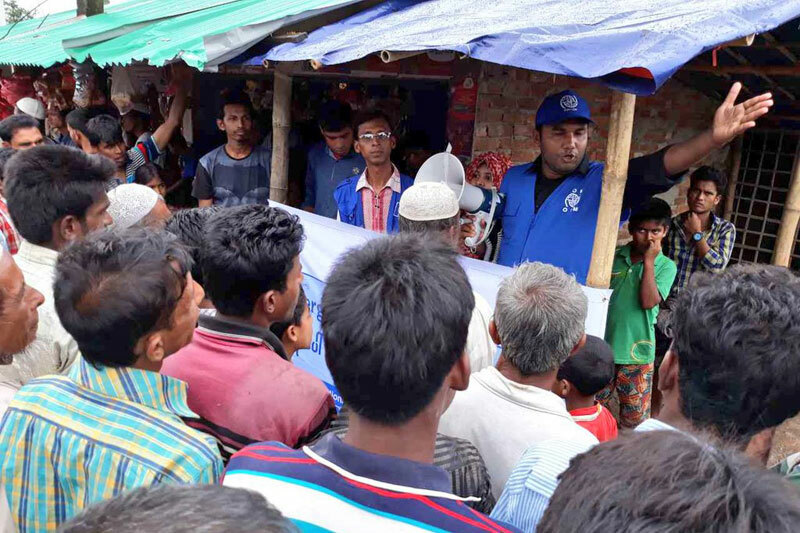 Together with the Government and humanitarian partners, IOM is responding to the needs of the most vulnerable new arrivals, while still providing assistance to the Rohingya population, who had been living in Bangladesh prior to this latest outbreak of violence. During the meeting, Prime Minister Hasina reiterated her Government’s full support for IOM’s role in coordinating the response, through the Inter Sector Coordination Group. Informal settlements and spontaneous sites, which have emerged over the last few weeks as unprecedented numbers of people arrived, are hosting the largest numbers of displaced people with almost no services available. Emergency response in these settlements is being scaled up to meet their health, safety, and security needs, but the needs far outstrip the capacity currently in country. Women and children are the majority of those fleeing, they bear the brunt of the conflict and the humanitarian response is being tailored to their specific needs. The Prime Minister noted that access to safe and dignified shelter, health and education are top priorities in her Government’s support for new arrivals. Through partnership with the Government, IOM is providing emergency shelter, water, sanitation, and other core relief items, which are vital as heavy rains continue. IOM is also conducting site planning for the new temporary displacement site on the land allocated by the Government near the Kutupalong Makeshift Settlement, as well as allocating and building up site management capacity in existing makeshift and new spontaneous sites. The Government has allocated 400 million Taka (about USD 4.8 million) to the construction of access and internal roads and drainage by the military. Since the end of August, over 242 emergency latrines have been installed by IOM throughout the sites to improve sanitation. Due to the lack of groundwater, IOM continues delivering 72,000 litres of safe water daily to targeted sites. 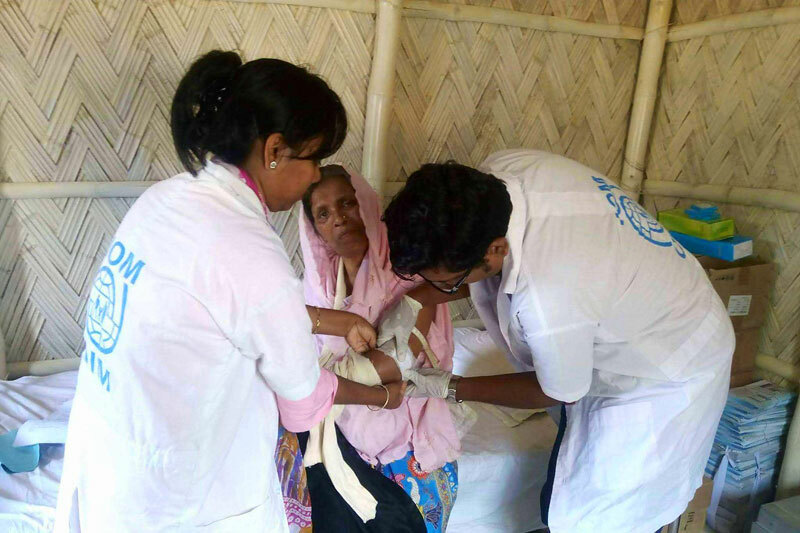 The Government of Bangladesh has mobilized medical outreach workers to provide health care, the armed forces to shuttle goods from the Chittagong airport to Cox's Bazar and local administration staff to provide readymade meals to up to 100,000 people a day, among other humanitarian support. Over the past three weeks, IOM has provided emergency and primary healthcare services to over 18,000 new arrivals and 9,500 others from the Rohingya and host populations. Sixty-four babies have been delivered and IOM has provided referral services to another 226 patients. These services were provided through 12 IOM teams operating from Government health facilities in Ukhiya and Teknaf, as well as three IOM mobile medical teams, which provide basic and primary healthcare services in three spontaneous settlements. A clinic located near Kutupalong Makeshift Settlement and the new site has started seeing patients, while final construction is being completed. IOM and the World Health Organization, with partners, will conduct an immunization campaign targeting 150,000 children in the coming days. WHO has already deployed immunization and surveillance support. IOM has been putting measures in place to counter gender based violence and human trafficking, while also working with extremely vulnerable individuals to ensure that they get appropriate help, including psychosocial and medical services. Frontline responders have been trained on the identification and handling of vulnerable cases in need of protection. To provide safe spaces to people in need across the displacement sites, an agreement with a partner NGO has been signed. 440 Dignity Kits, which contain hygiene and sanitary items, as well as other items explicitly tailored towards the needs of women and girls, have also been distributed among the new arrivals. Emergency Information Service centres have been made operational in displacement sites in Shamlapur, Balukhali, Leda, Kutupalong, Moiner Ghona, and Unchiprang. Emergency lifesaving information are being disseminated through these centres. This bilaterial meeting came a day after the pair had participated in a high level meeting, convened by the Organization of Islamic Cooperation, on the worsening crisis in Northern Rakhine State, Myanmar. With increasing unmet needs of the now over 800,000 Rohingyas in Bangladesh, IOM appeals to UN Member States at the General Assembly to support the inter-agency emergency response. The details of IOM’s current appeal can be viewed here.